This introduction provides an overview of Guild AI core functionality. Follow the steps under the each Example section below to get hands-on experience with Guild. By following the examples, you will implement a Keras image classifier as described in TensorFlow’s Train your first neural network: basic classification. Refer to the completed project for the full example. Guild features are be enabled for a TensorFlow or Keras project by adding a file named guild.yml to the project root directory. We refer to guild.yml as a project Guild file. Guild files supplement TensorFlow and Keras projects. You often don’t need to modify your project source files to take advantage of Guild features. Guild files are YAML formatted files that define models, model operations, model resources, tests, and packages. In this example, we create a Guild project that contains a basic model definition. If you haven’t already done so, install Guild AI. In any command example, you can click the word COMMAND in the upper right corner to copy the example text to your clipboard, which you can paste into your console. description: Basic Fashion-MNIST image classifier. As with command examples, you can click the word YAML to copy the example to your clipboard, which you can paste into your text editor. Save your changes to guild.yml. ./fashion  Basic Fashion-MNIST image classifier. The value ./fashion is the model source and name. The source ./ means that the model is defined in the current directory. Both the model name and description come from the Guild file you just created. Guild model definitions represent the TensorFlow or Keras models in your project. In the examples that follow, we fill in details to create a fully functional classifier for the Fashion-MNIST dataset. Prepare a dataset for training. Train a model using transfer learning. Fine tune a trained model. Evaluate a trained model on a test/validation dataset. Quantize a trained model to use 8 bit integers. Use a trained model to make predictions. Run a trained model as an inference server. You’re free to define the operations that suit your model—Guild does not prescribe a set of operations that must be supported. You run an operation using the run command. As we’ll see in the next section, each operation run is tracked as a separate experiment. If you are following the examples, in this section we add a train operation to our model and run that operation as an experiment. description: Train classifier from scratch. This change adds a train operation to the model with a description and a main module. You can use ops as a short cut to the operations command. We use ops through the rest of this introduction. ./fashion:train  Train classifier from scratch. The value ./fashion:train is the full operation name, which contains the model as well as the operation name. Guild automatically generates help from the Guild file. This information is useful for working with the project, especially as it becomes more complex over time. Press q to exit the help screen. This is okay—we expect this error because our project is missing the train module. Guild operations are implemented using Python main modules—i.e. Python modules that can be executed as a program (see Python help for details). Any Python script can therefore be used for a Guild model operation. Let’s create the missing module. For details on the network architecture, see Build the model in the TensorFlow basic classification example. Guild runs the train operation by executing the train module as a program—the operation is implemented by that module. The operation run is captured as an experiment. We examine experiments in the next section. Guild tracks each operation run as an isolated experiment that can be managed and used. Files generated by a run are written to their associated run directory and can be accessed as normal files. Guild saves operation metadata, process output, and process exit status for each run. Files generated by a run can be used as input to other runs. For example, model checkpoints saved during a train operation can be used as input to an evaluate operation. For information on managing runs, see Runs. If you are following the examples, in this section we use Guild’s run management facility to examine the runs generated in the previous example. The latest run is listed first and should have a status of completed, indicating that the operation exited without an error. The previous run is listed second and should have a status of error because the train module was not originally available (see previous section). The option ‑‑output tells Guild to include run output. The value 2 tells Guild to show information for the run with index 2 (see listing above). Note the error message in the output. This information is retained as a part of the tracked experiment. As with the runs info command, the value 2 is a reference to the second run in the list. Guild prompts you before deleting the run. Press Enter to confirm. After deleting the run, you can verify that it was deleted by running guild runs. If you make a mistake and delete a run by accident, you can restore it using runs restore. For a list of deleted runs, use guild runs ‑‑deleted. We can omit a reference to the run in this case—Guild assumes you want to show files for the latest run. These are the log file and trained model weights. Guild tracks these files along with all other run related metadata. By default ls shows relative file paths. You can show full paths by including the ‑f option. This is useful if you need to access a particular file on the file system. 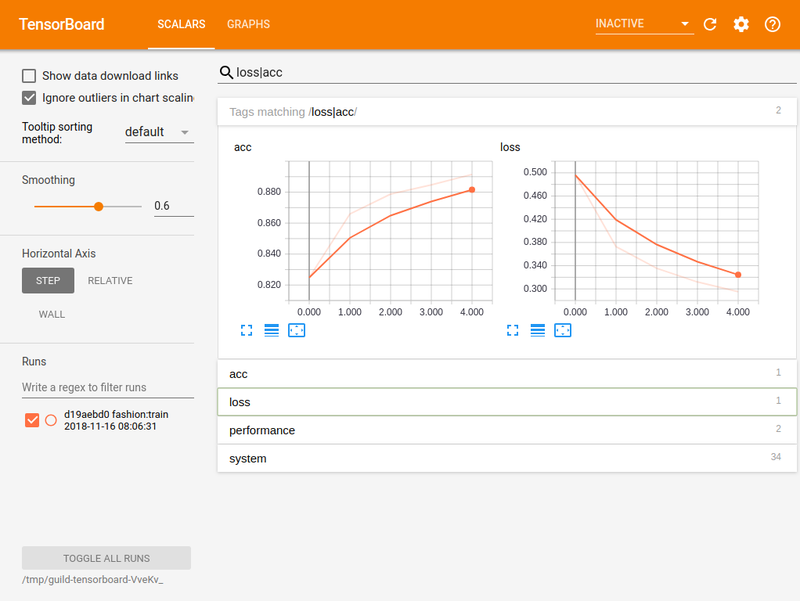 View TensorFlow event logs in TensorBoard. Show basic run information (try guild runs info ‑‑help for a list of options). Open the run directory in your system file browser. For the commands guild view and guild tensorflow, you must press Ctrl‑C in the console to quit the application and return to a command prompt. Guild operations automate model related tasks. While train is a common operation, it’s not the only operation a model may support. For example, prior to training a model, you may need to prepare a dataset by processing raw data into a format that can be used efficiently for training and validation. Your model may therefore have a prepare-data operation that automates that task. Similarly, after training you may need to evaluate a trained model with test or validation data—your model may have an evaluate operation. By running various operations, you use Guild to automate your workflow. Before training a model, run prepare‑data, which loads raw data from a database and processes it using various transformations. You can use operation flags to specify which transformations should apply and how examples should be split between train and validate. Once the data is prepared, run train. This is a “train from scratch” operation, which means that model weights are initialized with their starting values (e.g. randomly generated) without the benefit of prior training. This is typically a long-running operation that can take several hour or even days. As with prepare‑data you can use flags to specify training parameters such as learning rate. As the model trains, run evaluate to check its status. This can be a time consuming operation, depending on how thorough the evaluation is. Run it alongside the train operation without having to stop training. Once a model is trained, you can fine-tune it with additional training—but with different parameters, such as a lower learning rate. You run finetune, which initializes the model weights with the values from a previous train operation. As with train you can check progress by running evaluate and stop operation when model accuracy is no longer improving. When it’s time to deploy a trained model for use in a mobile application, run the tflite operation to generate a TF Lite file. The operation uses the learned weights from the finetune operation to create a frozen inference model and corresponding TF Lite file. This is just one example of a model workflow. Your workflow will be different based on the type of model and the applications you build with it. description: Use trained model to make predictions. This adds a new operation predict. It also adds a resource named trained‑model, which is required by predict. Resources are used to resolve source files needed by an operation. In this example, the predict operation needs files generated by the train operation. predict requires trained‑model, which means that all of the sources defined for the trained‑model resource must be available to the predict operation when predict is run. The trained‑model resource defines a single source, which is the output generated by the train operation. The trained‑model resource path is model, which means that each of source files are located in the model run subdirectory of requiring operations. When predict runs, it looks for trained model files in a run subdirectory named model. It uses these to initialize the model variables before making any predictions. Next, we need to create the predict module. We’ll download it along with a second module fig, which is required by predict. A module required by predict. ./fashion:predict       Use trained model to make predictions. ./fashion:train         Train classifier from scratch. Guild runs the operation, which selects five images at random from the Fashion-MNIST test dataset and classifies them using the trained model. The prediction for each image is plotted in a png file located in the operation run directory. Each png file is an image generated by the predict operation. The files under the models subdirectory (e.g. model/weights‑*.hdf5) are generated by the previous train operation. The predict operation uses these files to initialize the model weights. Guild makes these files available when it resolves the trained‑model resource. Clicking the FILES tab, and then click one of the png files. Press Ctrl‑C in the console to quit Guild View and return to a command prompt. Alternatively, run guild open to view the run directory in you system file browser. From there you can open images in the image viewer of choice. If the model misclassifies an image, the image name contains the text error. Your run may not have errors as the images are randomly selected—try running the operation a few more times to see if the model misclassifies an image. Guild provides a test facility to verify model behavior. The primary method of testing is to run operations and to check the contents of generated files. If you are following the examples, in this section we add a test to our project that can be run to verify model behavior. This adds a test named fashion to the Guild file, which is used to check the model’s train and predict operations. If the operations complete successfully the test will pass, otherwise it will fail. Guild runs train and predict—the operations should complete without error and Guild shows All tests passed. Guild supports packaging and distribution your models, which allow others to use your models by simply installing a package. Once installed, packaged models and their operations are available just like project models. You can install and use models developed by others. For more information, see Packages. If you’re following the examples, in this section we package our model for use by others. This adds a package element to guild.yml that provides information Guild uses to generate a package. We include the list of required packages to ensure that those packages are available when our package is installed. Guild creates a file dist/fashion‑1.0.0‑py2.py3‑none‑any.whl. This is a Python distribution archive that is used to install the fashion model. You can distribute this file to friends and colleagues who want to use your model. For example, upload the package as a release on GitHub. To install the package, a user runs guild install, specifying the path to fashion‑1.0.0‑py2.py3‑none‑any.whl. The steps in this section are optional—follow them to experiment with your packaged model. The last step is not required to use the installed fashion package. However, by changing out of the project directory (i.e. sample‑project) you avoid displaying its Guild file contents in the commands below. 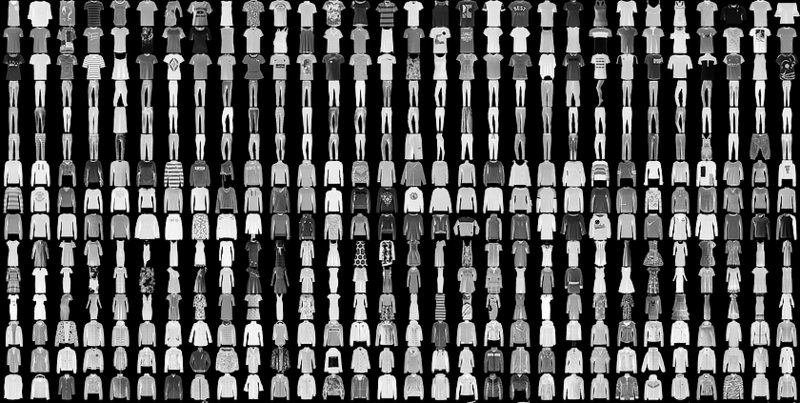 fashion/fashion  Basic Fashion-MNIST image classifier. The value fashion/fashion is the full model name including the model source. In this case the model is defined in the fashion package. fashion/fashion:predict  Use trained model to make predictions. fashion/fashion:train    Train classifier from scratch. In this case you must specify the package to test. Press Enter to continue. Guild runs the two operations associated with test. When the two operations are completed, you may use the various Guild run management commands to view the results. Press Ctrl‑C to quit Guild View and return to a command prompt. Press Ctrl‑C to quit TensorBoard and return to a command prompt. These steps simulate a user’s experience when installing and using your Fashion-MNIST image classifier. Once you package your model, you need only distribute the package archive (e.g. fashion‑1.0.0‑py2.py3‑none‑any.whl) to users for them to install and use your model. In this introduction we present Guild AI core functionality with step-by-step examples for hands-on experience with the toolset. Guild AI supports TensorFlow and Keras model automation and provides a comprehensive set of features to improve developer productivity and facilitate model reuse for application development. Guild models can be both project based and package based. Project based models are defined in Guild files (i.e. files named guild.yml) that reside in a project root directory. Guild files contain model definitions, including operations and resources used by operations. Guild files can also contain tests and package definitions. Guild packages are used to distribute models to other users. Packages are standard Python package archives that can be installed with pip. Package dependencies (e.g. numpy, matplotlib, etc.) are automatically installed with Guild packages, ensuring that operations work without additional installation steps. Guild supports experiment tracking and management. Experiments are created for each operation runs and can be viewed in various ways using Guild commands, including visualization tools for exploring runs and training logs.